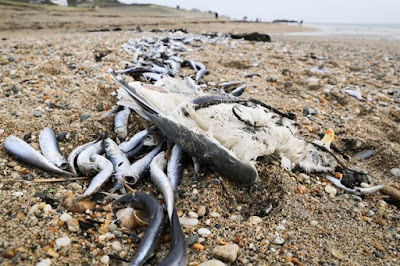 Dead seagulls, thousands of fish and a dolphin, have washed up on Marazion beach just one year after tens of thousands of fish washed up on the same Cornish beach and thousands of more of dead mackerel and herring on Pentwean Beach just a couple of miles away. Thousands of dead sea creatures have washed up on the beach are believed to have been killed by a lightning strike. Marazion beach in Cornwall was left littered with the carcasses of fish and seagulls after a spectacular electrical storm on Friday evening. None of them has any signs of injury and some locals reckon they must have been stunned by a bolt of lightning. According to Devon Live, a clear explanation as to why the animals have been killed has not yet been given, though there are currently multiple theories circulating in the area and on social media. Just over a year ago thousands upon thousands of dead mackerel was found dead on the same beach, see right. 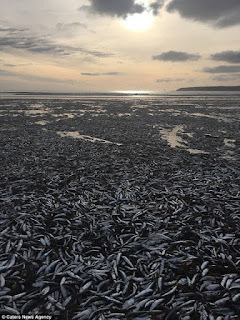 It has reminded many of the tens of thousands of mackerel, which stretched “as far as the eye could see” along the same beach on the morning of December 18, 2016. Then, some blamed it on being the result of a bycatch. Earlier last December tens of thousands of fish washed up on a Cornwall beach locals came across stacks of dead mackerel and herring on Pentwean Beach, just a couple of miles from Marazion beach. It was thought but not confirmed the Pentwean Beach kill was linked to fishermen throwing away a fish catch which was not acceptable to stringent EU fishing rules, which, when you think about it is absolutely stupid. Though the lightning theory is plausible it seems strange only three species suffered death, electricity would have killed all species in that particular area at the time of the strike.